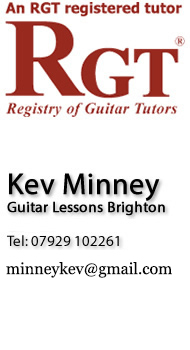 Guitar Tuition by Kev Minney - DipLCM ALCM LLCM. Large Group Lessons - £100 for 8 (hour and half) Lessons. Please get in touch to see when the next term starts. Mini group lessons - you and your friends can learn together! Mini group lessons of 4 people (minimum of 4 people or more) for £125 for 8 weekly lessons - 1 hour - each lesson.
" I highly recommend Kevin as a Guitar tutor, He left Northampton to Move to brighton, Which was northampton lost and Brightons Gain"